Contemporary office interiors need to be attention grabbing. Glass partitions achieve this. Specifically, by creating brighter, more inviting Toronto office spaces. 808 Smith Glass create tempered glass wall dividers suitable for a variety of office applications. 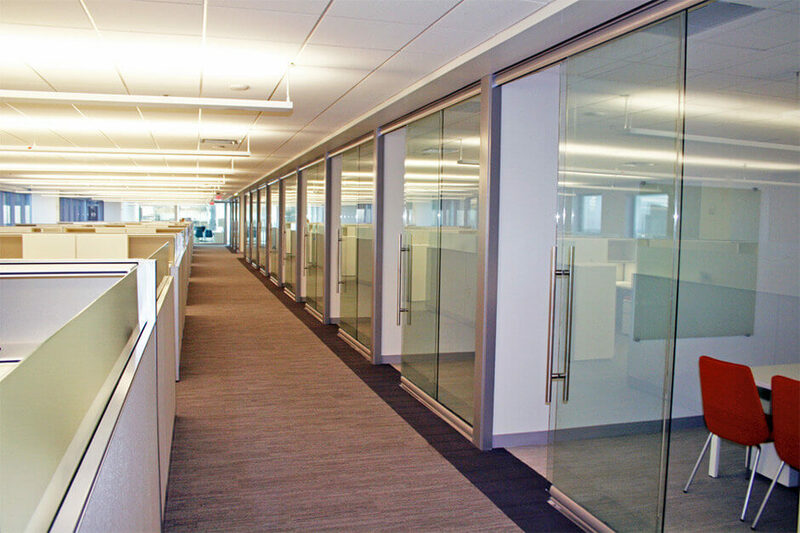 Our glass wall systems reinvent the look of offices and company headquarters. To partition your interior more elegantly, reach out today for a free, no-obligation initial consultation. Glass wall systems are proven to help boost office morale and workplace productivity. By design, a floor to ceiling glass partition allows more natural light to flood a workspace. Instantly, Toronto work areas appear visibly larger. This brightens employee moods. Meanwhile, clean lines and openness build trust on the part of office visitors. Natural lighting is proven to result in higher employee self-esteem and healthier sleep/wake cycles. However, glass partitions also boost office productivity more directly. When used in floor to ceiling partitions, tempered glass results in instantly brighter, more refreshing workspaces. However, glass wall systems also provide several architectural benefits. On average, offices refubish every 8 – 10 years. However, frameless glass has timeless appeal as an interior design material. In 8 – 10 years, a glass partition will look just as contemporary and ultra-modern as it does today. Partitioning an office with glass panels adds Westworld like futurism to property interiors. This resonates with visitors and makes potential clients more likely to remember and recommend your brand. Research consistently demonstrates the relationship between better natural lighting and better health. Toronto office workers in well-windowed workspaces sleep better, have fewer sick days, and feel more motivated. Glass wall systems can be used decoratively to make a fantastic first impression on office visitors. Sandblasted and engraved glass panels create a bright, open look in lobby and reception areas. Meanwhile, glass panels can also be used to complement the aestheics (and functionally) of building stairwells, railings, and office escalators. Tempered glass used in Toronto partition walls measures 5mm in thickness. However, panel widths and wall system designs are also fully customizable. Toronto office spaces can be noisy and chaotic at times. For this reason, 808 Smith Glass can install for-purpose sound-blocking glass partitions. 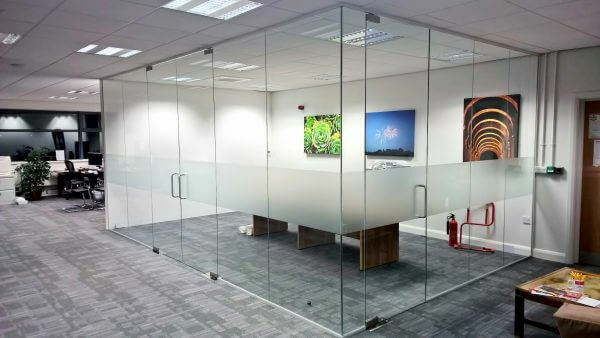 Glass partitions themselves can also be full height (floor to ceiling) or vary in size in accordance with different bespoke design requirements. Frameless glass used in office contexts is striking for its aesthetic simplicity. 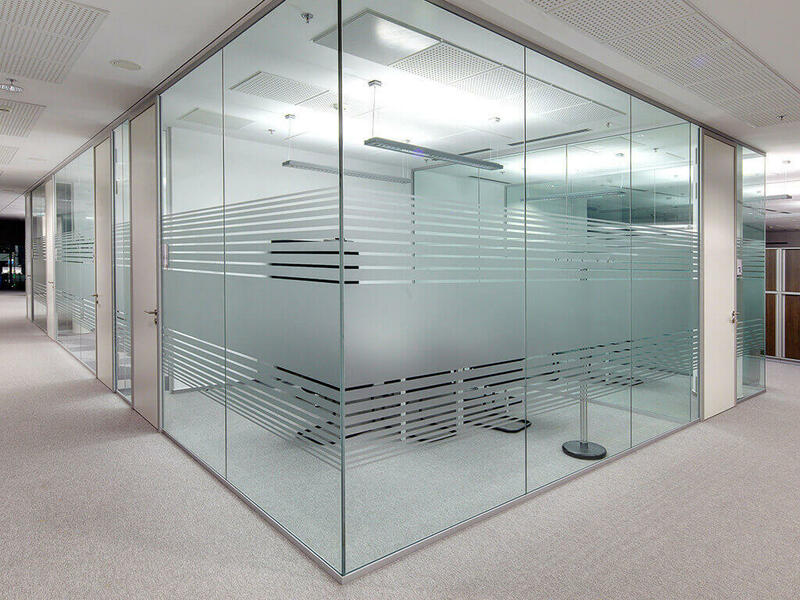 However, glass used in a cubicle or office partition can also be custom decorated. In office and boardrooms where privacy is paramount, sound-blocking and sandblasted glass can be used to keep meetings and conversations 100% confidential. In like regard, double glazed, etched, and engraved glass can be custom fabricated to complement the aesthetics of any office lobby or reception area. 808 Smith Glass are the first choice in Toronto for frameless glass wall systems. Plan and future-proof the design of your office. Call or contact a member of our customer service team and benefit from a free, no-obligation initial consultation. .